Welcome to the Michelin complaints department brought to you by HissingKitty. Experienced poor customer service? We make it easy to file a formal complaint against Michelin online. Simply use our free form and your feedback will be instantly forwarded for review. Need to contact the Michelin corporate office? We have the mailing address, phone number, and email address listed below. This tire has proven to be a great disappointment. All my previous experience with Michelin has been positive. But the Latitude V101 is not crafted for Colorado weather. They are a hazard in wet/snowy conditions and the tread wear is abysmal, not 3,000 miles before needing to be replaced. I purchased two tires each: on 11-15-18 at Big O and on 12-21-18 at Larry Miller Chrysler. I must now buy tires again, they will not be Michelins!!! To whom it may concern; I purchased 4 michelin tires from chatsworth tires in chatsworth,c.a. three months ago Nov.2018. I haven't received my $70.00 rebate check in the mail. I was very happy with the excellent serves and very an appreciate with the tires . They drive extremely great with my car. please update me with rebate information. Sincerely, Greg T. Higgins P.S. call me at 661-8574058 a.s.a.p.. In April 2015, I bought a set of Michelin tires for my Ford F150. Tires came with a 48 month / 90,000 mile warranty.Tires were rotated every 5,000 miles and the alignment was checked at each tire rotation and aligned as needed. At 40,000 miles, the tires are down to 3/32" tread. The actual mileage is about 45% of the warranty which I understand is pro-rated based on tread wear.. Tire Discounters where I purchased the tires contacted Michelin. Michelin's first offer which I refused was to cover 20% of the replacment cost. Their second offer, also refused was 34%. The math is pretty simple. Michelin should cover 55%. I purchased my 2014 Camry LE auto from Sloane Toyota, of Glenside, PA new. It is equipped with Michelin Energy Saver tires which are advertised as having a 65000 mile treadlife and a fuel-saving design. I have had he car serviced at my local Toyota dealer (Peruzzi Toyota} during and since the warranty period , including rotation of the tires and alignment as recommended during my ownership. With less than 30000 miles of driving, I have been informed hat the tires need replacement. Furthermore, while I have been a conservative driver, I have rarely gotten over 23 or 24 miles per gallon of fuel while the care is rated at 25 MPG city and 35 MPG highway, or an average of 28 MPG. I have been satisfied with the ride, handling and braking abiiity of the tires but very dissatisfied with their tread wear and fuel consumption characteristics. I live in the Philadelphia, Pa suburbs and feel my driving is roughly 50/50 town and highway. I feel that the tires have not lived up to their promise and that I am due some amount of adjustment for that failure to produce the performance and fuel dollar savings you claim in your sales presentation. I am 2 years into a 39 month lease on a GMC Acadia. The vehicle has Michelin 235/65R18 tires on it. I currently have 30K miles. I get these tires rotated at the dealership every other oil change (6K miles per recommended). All four of these tires need to be replaced already as they are down to the wear bars. I have leased many vehicles and never had to replace tires within the 3 years. I believe tires should last longer than 30K miles. When going to check on replacements they said this particular brand of tire is JUNK!! I believe you should stand behind your tires and replace these. 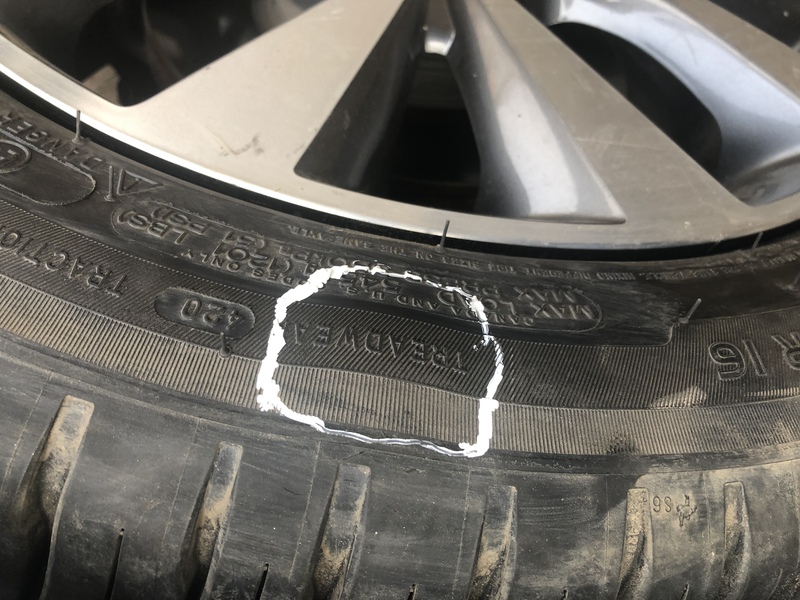 Bought 4 Michelin tires started sidewall cracking at 3 years Went back to store mgr of tires said normal wear Went to another tire store said chart shows severe damage defective Factory gave me more than 50 percent off new Michelin tires Jan Consumer Report says sidewall wear worst than tread wear. Went back to Sams mgr never took my name said would talk to tire mgr. This was a safety issue they don't care. He never said sorry for your trouble. I have bought four new Michelin tires. Loved the service and was definitely a satisfied customer...until recently. I had a blowout on the highway while taking my daughter to school. Luckily, no one was injured. I took the car to get it fixed and they replaced it for free since it was under warranty. I drove the car again, sure that everything was fine. Until I had another blowout! Again, no one was injured but it was still a scary experience and am fearful of using Michelin tires since they just seem to blowout all the time. Don't use them, you never know what incident might occur if you do. We had to change our car tires as it was old and worn out. So went in and replaced it to 4 Michelin tires. I ran it for around 300Kms and I am totally satisfied customer. I have taken my car on rough roads and sharp turns. Found it to be running really well and no issues at all so far. They are absolutely of great quality. I feel Michelin has done a great job in understanding the roads and what type of tires are need and made this product. Very low on the noise level and smooth ride. I am now convinced that my investment on the car tires have not gone wasted. Highly recommended for anyone planning for a quality product of tires.